On the evening of December 4, 2018, Auschwitz Institute for Peace and Reconciliation (AIPR) Executive Director Tibi Galis and Chief of Staff Jack Mayerhofer presented a new policy brief, focused on Germany’s 2019-2020 term as a member of the United Nations Security Council, at a launch event co-organized by AIPR and the brief’s publisher, Friedrich Ebert Stiftung-New York (FES). 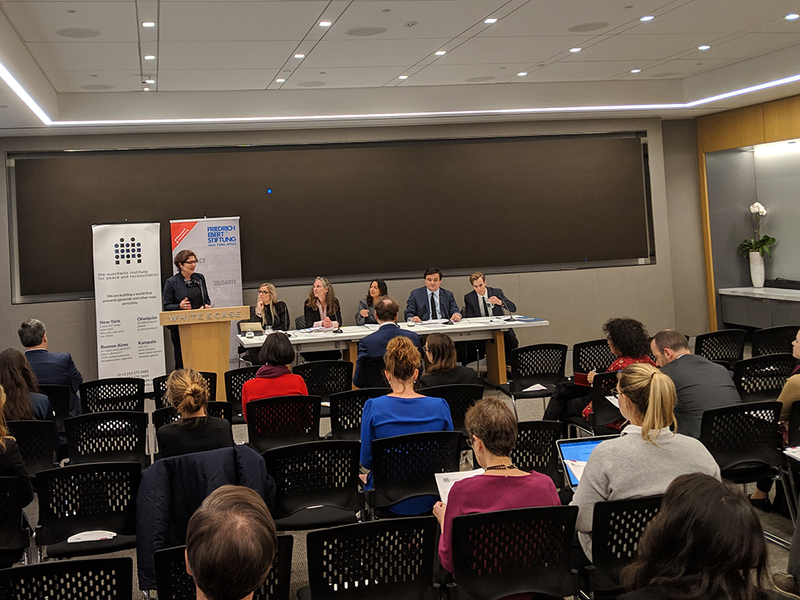 The launch, which was hosted by White & Case LLP in New York, featured an interactive discussion panel with the two authors as well as invited representatives from civil society and the Permanent Mission of Germany to the United Nations. Entitled “Making ‘Never Again’ a Reality: What Germany Can Contribute during Its Next Term in the Security Council toward Preventing Mass Atrocities,” the policy brief offers and contextualizes a series of six recommendations to guide Germany through its tenure on the Security Council. The contents of the brief emphasize the need for Germany to drive action – in lieu of reconceptualization – on atrocity prevention during this critical moment in global affairs. The authors also highlight the importance of viewing Germany’s Security Council membership as an opportunity for the country to honor its history by putting its self-identified global responsibility for crisis prevention, conflict management, and peacebuilding into action. 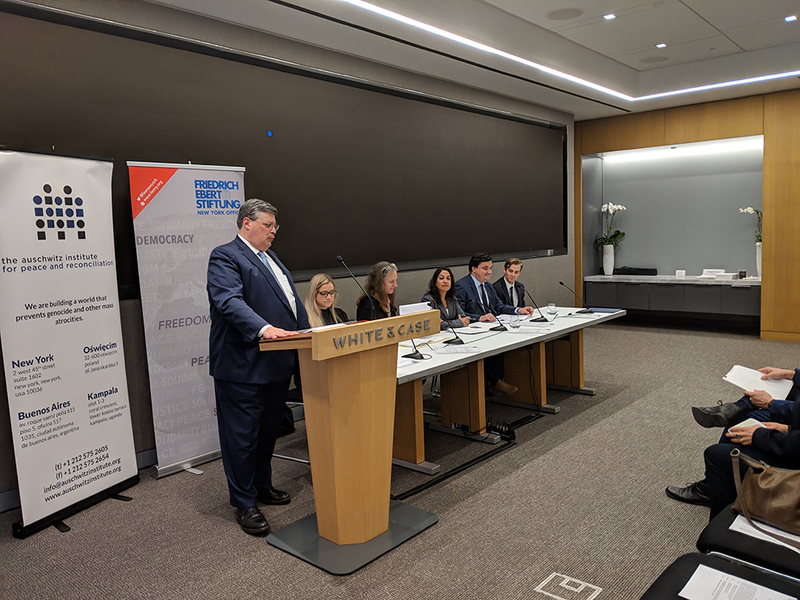 The launch event was opened by welcoming remarks from Owen Pell, Partner at White & Case and President of the Board of Directors of AIPR, who was followed by Luise Rürup, Executive Director of FES-New York. Panel moderator Sapna Chhatpar Considine, Director of Strategy for Humanity, then turned the floor over to the authors of the brief, who gave a short overview of the contents and discussed the broader context within which the recommendations were synthesized. Following this, Kerstin Pürschel, First Counsellor at the Permanent Mission of Germany to the UN, and Brittany Roser, Program Officer at the International Coalition for the Responsibility to Protect, made brief remarks about Germany’s opportunities and responsibilities during their upcoming Security Council term, as well as the current state of the atrocity prevention agenda at the United Nations, more broadly. The event was then concluded following an interactive question and answer session between the panelists and event attendees. The policy brief, “Making ‘Never Again’ a Reality: What Germany Can Contribute during Its Next Term in the Security Council toward Preventing Mass Atrocities,” is available for free electronic download. Please click here to access it on the FES-NY website.